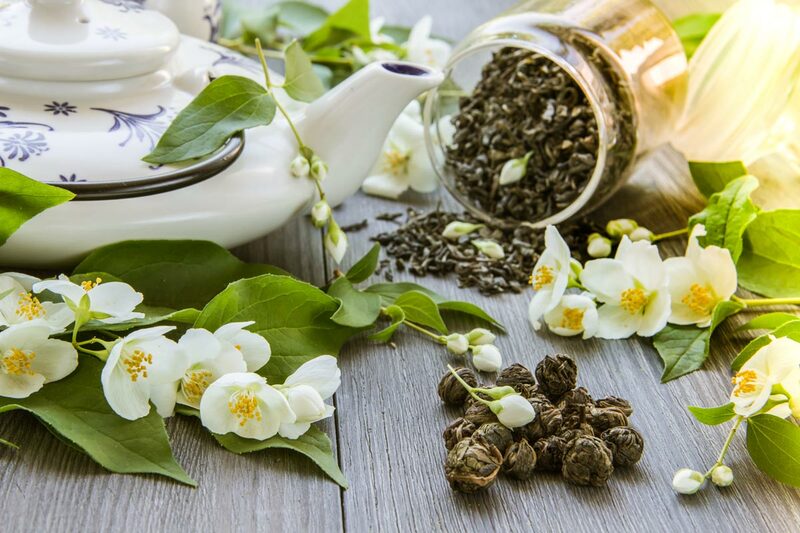 What is Jasmine Dragon Pearl tea? A higher quality Chinese jasmine green tea usually takes the shape of jasmine scented hand rolled ‘pearls’, each consisting of two young leaves and an unopened bud. These pearls unfurl in your cup, releasing the combined aromas of green tea and sweet jasmine. The tea leaves themselves have characteristic silver tips and are picked when young for a soft, subtle flavor. As per Chinese mythology, a young girl from a village near Fuzhou, Fujian Province, sought the help of a mystical dragon in curing her seriously ailing brother. The dragon is believed to have soared high up into the sky and developed a beautiful pearl on his chest. A droplet of water fell from this pearl and gave rise to a tea bush. The girl tended to this miraculous bush, picked its leaves, dried them with jasmine flowers, and shaped them into ‘dragon pearls’. Tea brewed from these pearls cured her brother and originated the tradition of drinking Jasmine green tea throughout the region. Traditionally, real jasmine blossoms are added to green tea while tea leaves are still drying and easily absorb the lavor of natural flowers. After a few hours, the jasmine flowers are removed and replaced with fresh ones. The process might be repeated up to 7 times. Then, the tea leaves are rolled into tiny balls, preserving the scents inside. The process is laborious and time consuming, but the result is definitely worth it. Delicate jasmine flowers do not possess the strength of industrial flavorings and essential oils. The idea is that floral component should not dominate, but rather subtly complement the vegetal green tea flavor in your cup. Jasmine green tea makes a pale yellow infusion, balancing a strong, bold aroma with a crisp jasmine scent. “Sweet and floral tasting, with no bitterness”, this tea easily makes its way to the average green tea drinkers favorites list. It has a lingering aftertaste, and leaves you with “the presence of jasmine in the back of the throat”. The subtle, sweet floral tones make this a “delightful summer tea”, refreshing, sweet, tremendously fragrant. Authentic Jasmine green tea will have a flowery taste, in addition to its floral smell. Lower quality commercially scented floral teas may be flavored with variety of essential oils, natural and artificial flavorings. The real thing will always be more subtle and delicate. Organic green tea, jasmine flowers. Organic Spring Jasmine is made of smooth China green tea leaves naturally scented by layers of Arabian jasmine buds. With an intoxicating aroma and a piquant yet rounded cup, Organic Spring Jasmine is our twist on a Chinese classic.